Features: Hassle free, lightweight and compact cordless hedgetrimmer, supplied with 2.0Ah lithium battery and fast charger,common to the Grass Trimmer and Leaf Blower in the 18V range. 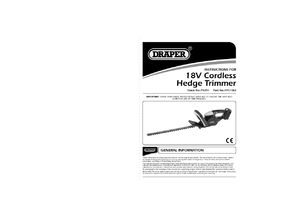 If you require further information about"Draper 18v Cordless Hedge Trimmer 75291 (Htc18li)" please contact us. Please Note: We are not Draper Tools Limited .